With riot police on scene, two of the Hall Building’s windows were smashed and the police used pepper spray inside the building, which was then carried through the ventilation system. This came after protests erupted in the building on Sept. 9, 2002. The protest was triggered after then-former Israeli Prime Minister Benjamin Netanyahu came to Concordia for a speech. Organized by campus pro-Israeli student group Hillel Concordia, the controversial talk was cancelled before Netanyahu left his hotel. Soon after, organized discussions of the Israeli-Palestinian conflict were banned on campus by the Board of Governors in a closed session meeting. The policy prohibited Middle East-related activities on campus and prevented groups from tabling on the first and second floors of the Hall Building. The ban was partially lifted after complaints were sent to Amnesty International, but tabling was still restricted—excluding tabling for the Concordia Student Union elections. 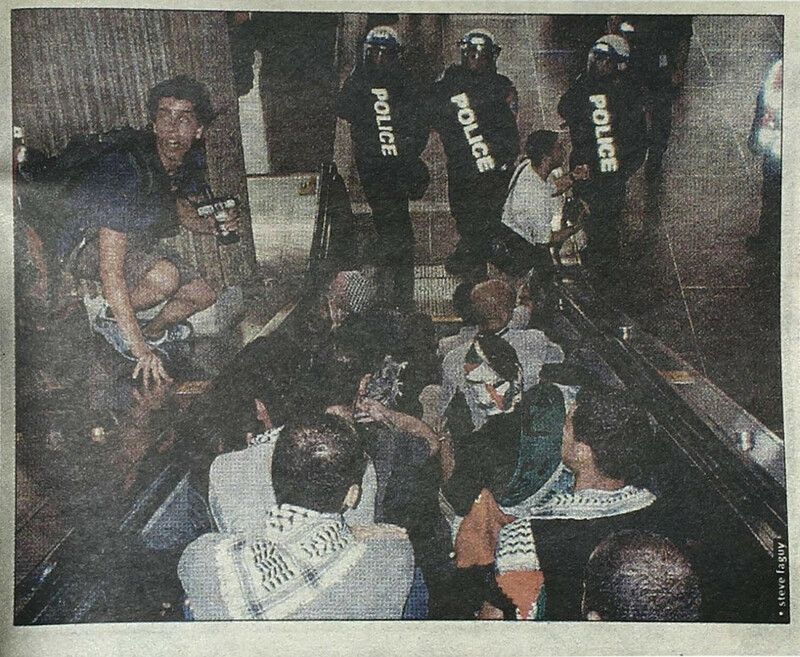 Sixteen years after the Netanyahu Riot, Palestinian activism remains ever-present in the halls of Concordia and on the streets of Montreal. Since then, Concordia students have made strides towards providing support for the conflict through educational events, talks and participation in the Palestinian-led Boycott Divestment, and Sanctions movement. The CSU officially divested in 2014 after Concordia undergraduate students passed a referendum in favour of Boycott, Divestment and Sanctions against Israel. Within two years, the CSU had divested $5.3 million. Over the past year, Palestine solidarity activism has continued to thrive in Montreal. The following is a list of some of the major events. Two men interrupt a panel discussion hosted by Solidarity for Palestinian Human Rights in the Hall Building. Shortly into the discussion, men with Israel flags draped around themselves came in chanting, “I’m Israel, we are here to stay.” The men continued chanting, “there is no Palestine, there was never any Palestine.” Rula Abisaab, a professor of Islamic history at McGill University, tried to read the poem “With Green We Wrapped Him” by Palestinian poet Izzidin al-Manasrah over the men. Panel viewers began to shout “shame” at the men, as Concordia security soon escorted the protestors away. Dozens of Palestinians are harmed in the West Bank after confrontation with the Israeli army, known as the Israel Defence Forces. IDF reports that many protesting Palestinians threw rocks at the IDF. The Red Cross reports rubber bullets hit at least 45 Palestinians. A spokesperson for the IDF says tear gas and non-lethal rounds were used to break up what they called a violent demonstration. A night march honors Palestinian Land Day outside of Mont-Royal metro station. Land Day marks the death of 6 Palestinians who died on March 30, 1976 protesting the expropriation of Arab-owned land to develop Israeli settlements in the area, where more than 100 were left injured. The CSU holds a press conference in support of 24-year-old Bissan Eid, a pregnant Palestinian student that was stuck in Gaza for four months following her arrival in June 2016. Under Israeli law, all citizens must obtain an exit permit to leave. Despite applying four months prior, Eid did not receive a permit or a reason for the delay. The CSU runs petitions and a phoning campaign to Prime Minister Justin Trudeau and pushes Concordia President Alan Shepard to take action to resolve the situation. Eid’s first child, Sarah, is born in Khan Younis in southern Gaza following Israel’s refusal to provide Eid with a permit to leave Palestinian territory to give birth in Canada or Jordan. People in Montreal head to the streets to recognize Nakba Day. The day marks the expulsion of 750,000 Arabic people from Palestine after Israeli Independence Day, when Israel became a state in 1948. Many in Palestine and Israel occupy the West Bank and Gaza Strip to mark the Nakba with marches and candlelit vigils. Nakba Day, translated from “al Nakba,” means catastrophe in Arabic. Palestine supporters gather at Norman Bethune Square to mark the International Day of Solidarity with the Palestinian People, which is recognized on Nov. 29. This day of observance was created by the United Nations in 1977. U.S. President Donald Trump announces plans to move the U.S. Embassy in Israel from Tel Aviv to Jerusalem. He announces the decision to Palestinian President Mahmoud Abbas and other Arab leaders via phone call. This causes uproar, as several holy sites create tension between Palestinians and Israelis over who has ownership of the city. In Gaza City, Palestinian protesters burn Israeli and U.S. flags following Trump’s confirmation the U.S. Embassy will move to Jerusalem. Opposers to the embassy display signs saying Jerusalem is the eternal capital of Palestine. A crowd of approximately 200 people protest at the U.S. Consulate to oppose the move of the embassy in Israel to Jerusalem. SPHR Concordia and many others join in. Overnight, the IDF arrests then-16-year-old Ahed Tamimi in her home in Nabi Saleh, West Bank. Prior to her arrest, viral videos had surfaced of Tamimi slapping an IDF soldier as their family protested the shooting of Tamimi’s 14-year-old cousin Mohammed Tamimi. He had been hit in the face with a rubber bullet by the IDF and survived. Through Facebook, IDF Major General Yoav Mordechai posts that during questioning, Mohammed Tamimi said his injuries were a result of a bicycle accident, despite having a six hour procedure with the aid of seven surgeons to remove the bullet from his head. Tamimi later says he lied about the bicycle accident to avoid jail time for protesting. As the streets fill with white snow, the colours of red, black and green from Palestinian flags stand out near Norman Bethune square where supporters of Palestine came to protest the opening of the U.S. Embassy in Jerusalem. One man carries a photo of recently incarcerated Ahed Tamimi. Israel begins trial for 17-year-old Ahed Tamimi, prosecuted with charges of assault and incitement. Israel receives criticism for indicting a minor, as Israel closes the Tamimi trial to the media. Support for the release of Tamimi grows and the Concordia and McGill chapters of SPHR join forces to protest in Norman Bethune Square. They organize as part of a global day of mobilization against Israel’s systemic target and incarceration of the Tamimi family. Thousands march at the Gaza border to mark Land Day. The IDF opens fire on the peaceful march, and 17 Palestinians are killed with more than 1,400 injured. The Palestinian Authority, which governs the Gaza Strip and parts of the West Bank, declares a national day of mourning. On a Sunday afternoon, protesters gather outside Guy-Concordia metro to support the right for Palestinians to return to their land, as well as to acknowledge and condemn the harm that resulted from Land Day. May 14 marks the 70th anniversary of the Nakba and Israel’s independence, as well as the relocation of the U.S. Embassy to Jerusalem. As Trump praises the move as a “great day,” violence erupts at the Gaza border. Some protesters throw stones, smoke bombs and Molotov cocktails, while the IDF responds with tank fire and imposing airstrikes. The Gaza Health Ministry reports 55 Palestinians, six of them children, dead at the border. By next morning the death toll had risen to 59. In response to the opening of the embassy and the attacks on Palestinians, protesters in Montreal gather in Phillips Square to hold two events, one during the day and another held in the evening. The familiar presence of Palestinian flags and the keffiyeh are wrapped around participants filling the streets as they march through downtown to generate awareness and condemn the U.S. recognition of Jerusalem as the capital of Israel. Thousands of Palestinians join to bury the protesters killed in the 70th anniversary of the Nakba in a march along the Gaza border. This Nakba is seen as the deadliest day in Gaza since 2014. 59 Palestinians are killed, mostly from gunfire. The high number of casualties among unarmed protesters receives international criticism. Israeli military says they were defending the border and condemn Hamas, a Palestinian militant group, for covering up protests as attacks on Israel’s border. The military also said rubber-coated steel pellets, sometimes used for non-fatal crowd control, are not adequate in preventing protesters from advancing to or passing the border.